Weddings in India are not just about two people getting married, it is also the union of two families and many times coming together of two cultures. While Indian weddings are a grand thing, Punjabi & Gujarati shaadis are larger than life, glamorous and a fun affair! 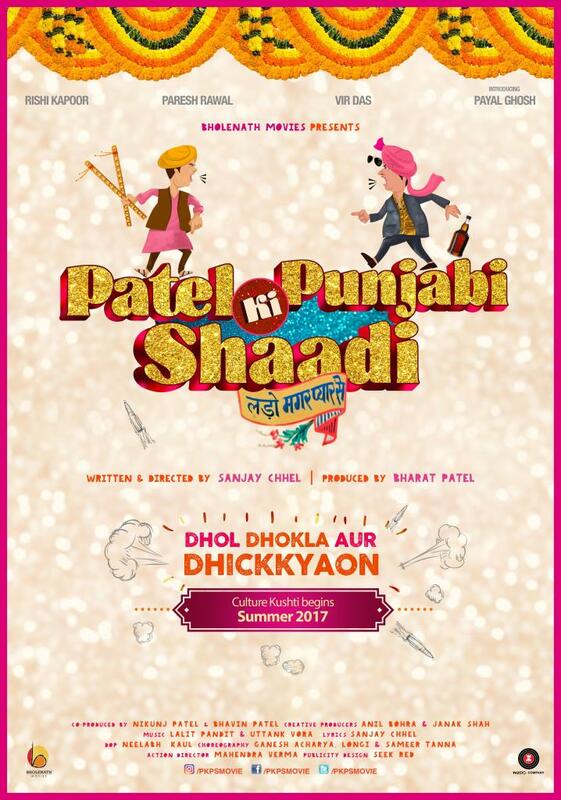 Upcoming film PATEL KI PUNJABI SHAADI will also explore these two rich cultures however with a sweet ‘n’ naughty clash, the teaser poster of the film reveals. Rishi Kapoor and Paresh Rawal starrer PATEL KI PUNJABI SHAADI’s teaser poster is out and promises a lot of fun. The film collaborates two fine actors of Bollywood – Rishi Kapoor and Paresh Rawal, who interestingly belong to two different rich backgrounds in real. Both of them last worked in Damini , almost 24 years back. Vir Das and Payal Ghosh play young lovers while the film also has Prem Chopra, Jinal Belani, Divya Seth, Bharati Achrekar and Tiku Talsania in pivotal roles.